The Carlyle Group and former Neuberger CEO Jeffrey Lane filed an objection in bankruptcy court Tuesday, claiming that the $2.15 billion acquisition of Lehman Brothers’ (LEHMQ.PK) investment management division Neuberger Berman, made Sept. 29 by Bain Capital and Hellman & Friedman — is too low and violates Lehman’s obligation of maximizing the value of its asset sales to pay off its creditors. The law firm of Wachtell, Lipton, Rosen and Katz is representing the case, according to WSJ. It is arguing on behalf of its client, The Carlyle Group, that the process upon which the acquisition of the crown jewel of Lehman Brothers’ asset-management unit (Neuberger Berman) was conducted did not allow Lehman Holdings to get the highest and best bids possible. The law firm asks for a “real auction” for the assets and reiterates its argument that the buyout process was contrary to legal principles that “a debtor which sells assets in a Chapter 11 case has an obligation to seek the highest and best values for the benefit of its estate.” Carlyle also mentions in its objections that the actual price is closer to $1.55 billion due to provisions and adjustments in the sale agreement. 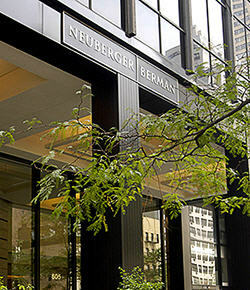 The Private-Equity Group intends to make a rival bid for Neuberger. A federal bankruptcy court is set to hold a hearing Thursday on the matter. Bain and Hellman’s acquisition of Berman, notes the Journal has yet to be approved. Both firms declined to comment.